It’s a muggy day in July when my Kazakh teacher, Aryslan, promises that I’ll have a free day tomorrow — he needs to go home to his village and prepare for his brother’s wedding. “If you go to a feast, go full!” Toiga barsan, toyip bar! I nod and laugh. I’ve just been to a Kazakh wedding that was at least eight hours long, and that was after a significant delay. Aryslan smiles. “Kazakh weddings always start late,” he says, “and that’s why you should go full.” The guests will eat all night long, but you may need to wait several hours before the feast actually begins. Aryslan comments that his Korean and American students never give wishes (tilek aitu) as Kazakhs do. We say a quick “congrats.” Kazakhs and Russians give rounds of well-wishes, as rows of people are called up to give their speeches and toasts. “No expenses, no profit.” Shygyn shyqpai, kiris bolmai. “But what do you get back?” I ask. “Gifts and presents. Or they invite you to their wedding,” he says. I laugh and show him a website: that’s exactly what the American anthropologist Cynthia Werner said after studying Kazakh weddings twenty years ago: even when money was scarce, people used weddings as a way to circulate gifts and help each other out. If you couldn’t pay for gifts or help out at weddings, the anthropologist said, you wouldn’t get invited to as many feasts in the future. Help was repaid with help. Those who couldn’t afford it were left out. “If rich people are in-laws to rich people, a camel walks between them.” Bai men bai quda bolsa, arasynda tuie juredi. “Equals with equals, cow-patties with carrying-sacks.” Teng tenimen, tezek qabymen. The implication is that it’s not good to marry too far above or below oneself. It turns out that Kazakh nomads once collected dried dung (tezek) in a bag (qap) and used it as fuel for heating a yurt. You wouldn’t just pick up poo and pile it in your hands without a bag: one is necessary for the other, just as equals should go together. Um. Okay. “Don’t go empty-handed!” Qul qol barma! I’ve already learned to bring some chocolates or a small hostess-gift when visiting a Kazakh household, but now he’s saying I’ve got to bring something to every event? And it doesn’t matter if you’re rich or poor, he assures me. As a child, Aryslan always brought a stick of gum to his friend’s house, even when he could afford nothing else. “Don’t stay away when you’re invited, don’t go when not invited.” Shakirgan zherden kalma, shakirmagan zherge barma! So all this etiquette sounds quite complicated — but Aryslan’s last proverb doesn’t let us just sit at home and watch old TV reruns online. The message: you can’t stay at home, boys, and avoid handing out your precious sticks of gum. 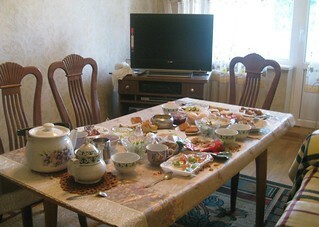 Kazakhs are known as gracious hosts, and honor their guests with hospitality. But Aryslan reminds us that the duty goes both ways: if we’re not invited, we gracefully don’t show up. But if we are invited, we can’t just lounge around all evening at home! Liked this? Leave your comments on / share the copy at PocketCultures!